The first Catholic building in Moree was the small timber church built in 1884 in Warialda Street and named St Henry’s by its builder, Fr Doyle, who at that time was caring for the Catholics in the Moree area from his Parish of Narrabri. If there was a foundation stone it seems to have been lost, but records show that the Church was blessed and opened in 1884 by the second Bishop of Armidale, Dr Torreggiani. It remained in use as a church until after January, 1930, when the new brick Church close to it on the corner of Warialda and Alice Streets was blessed and opened by the Rt Rev J A Coleman, DD, D Ph, Coadjutor Bishop of Armidale. Very Rev J J English, who was Parish Priest at the time, altered the name to Sts John and Henry. Although the Church was specially designed to cope with the treacherous black soil on which its stands, with deep reinforced beam and girder foundation, over the next fifty years serious faults developed, particularly in the arch before the altar, resulting in expensive repairs in the mid 1980s. Although East Moree had the distinction of having the first Catholic Church, West Moree had been developing as the main township from the time when James and Mary Brand opened the first store in Frome Street in 1852. 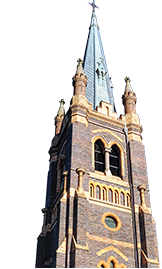 The original Convent had been functioning since 1902 when land was purchased from the Sisters for the building of Moree’s second Church, the Parish Church of St Francis Xavier. Begun in 1912, it was blessed and opened on Sunday, 15′ June, 1913 by his Lordship, Bishop O’Connor. The Parish Priest at the time was Fr Lloyd. A souvenir booklet produced for the occasion, tells us, “St Francis Church, Moree, as it stands, is incomplete, being without the tower and spire, which will be built, it is hoped, in the near future.” (Perhaps the intervention of World War 1 thwarted these plans). “The amount of the present building contract was £4,000, but extras and Church requisites will make the total cost approximately £4,800. To meet this outlay the Church trustees held £2,200, £650 of which was subscribed by our friends at the blessing of the Foundation Stone by his Lordship, Bishop O’Connor in December 1912. In 1958 the Church still lacked the tower and spire. It was decided that year that the Church should undergo substantial alterations – in particular, the raising of the floor above flood level, to the windows, the conversion of the old sacristy to a Nuns’ Chapel with the new one being sited on the other side of the Sanctuary. On either side of the entrance were placed Crying Room (now the Piety Stall) and the Robing Room for the Priests. When these alterations were complete, the Church was solemnly blessed and dedicated on 15` March, 1959 by Most Rev Bishop E J Doody and DD Right Rev Mons L J O’Reilly was the current Priest. It was later in the same year that a Memorial Stone was blessed and laid by the Bishop of Armidale for the honour of St Philomena’s on the occasion of the opening of the new Convent of Mercy.